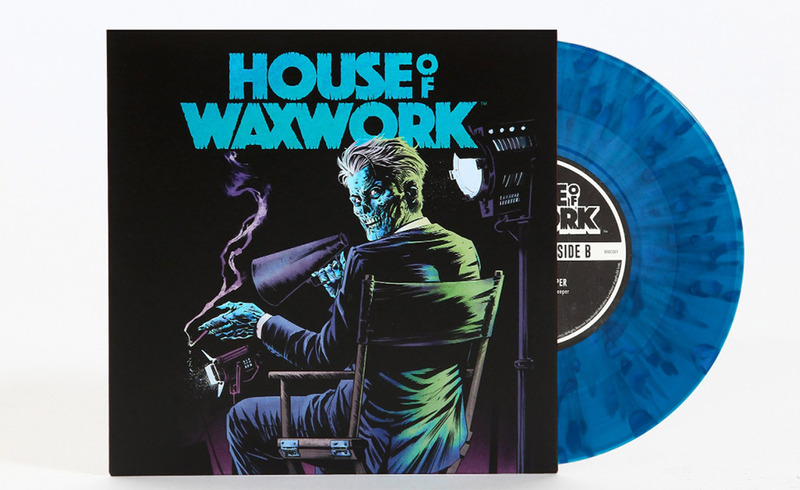 Waxwork Records started in 2013 and have since flourished into one of the top sellers of vinyl soundtracks, mostly of the horror movie variety. Some of their top soundtrack releases are: CREEPSHOW, THE BABADOOK, FRIDAY THE 13th Part 3, STARRY EYES, RE-ANIMATOR and many more. 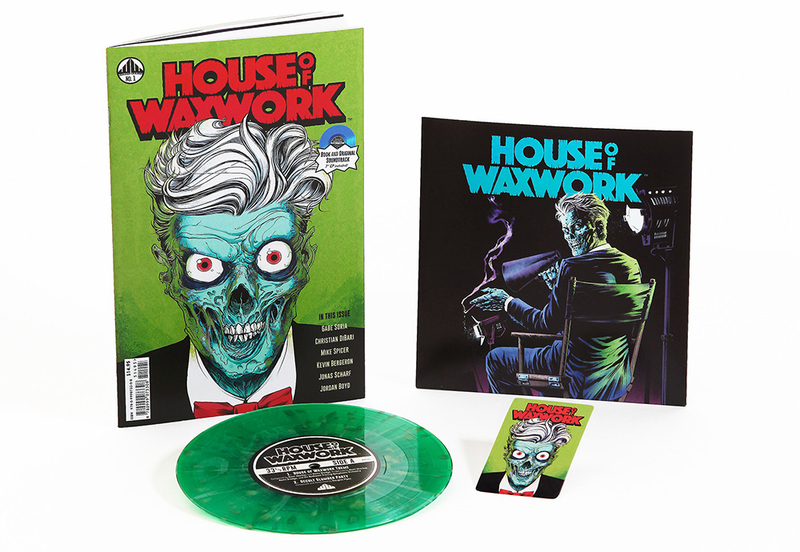 After a few years of success selling vinyl recordings, Waxwork Records is branching out into the publishing realm with their new subdivision, Waxwork Comics. Waxwork’s first release is House of Waxwork Issue 1, which features two original stories: The Lightkeeper and Occult Slumber Party. 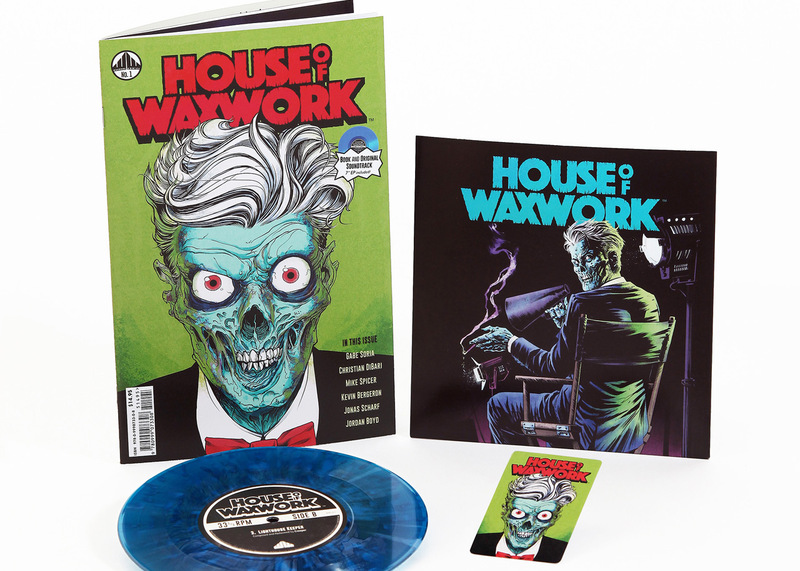 The comic also comes with a 7” vinyl soundtrack to play along as the stories are read for the ultimate horror comic reading experience. The issue is hosted, if you will, by a character called The Die-Rector. The Die-Rector is our guide through these haunted tales much like the famous Crypt Keeper of Tales From The Crypt fame. The first story in the issue is Occult Slumber Party written Gabe Soria. This heart-stopping tale follows a bickering family as they endure a family vacation in a rented mountain cabin. Bored to death and fighting, the father purchases a board game from a nearby convenience store. This tale proves that the family that slays together, stays together, as they get more than they bargained for with a roll of the DIEce. The second story is The Lightkeeper written by Kevin Bergeron. Recently released prisoner Stanley Lloyd is dying for a job, and he finds one minding a solitary lighthouse for three months. While Stanley may be no stranger to solitary confinement, he learns that time alone with only the sounds of the ocean to keep him company can play tricks on one’s mind. This story is a grim delight with an ending that will have you keeping your light on all night. House of Waxwork Issue 1 is well done, and reminiscent of the old EC Comics like Tales From The Crypt and Vault of Horror, as well as the recently republished graphic novel Creepshow, the tie-in comic to the movie. The artwork pops off the pages and the lettering is easy to read. Occult Slumber Party is a quick read, and that is actually its drawback. The story moves too quickly, and I was left wanting more time within the game. Occult Slumber Party reminded me of BEYOND THE GATES, and if you are a fan of that movie you will like this story as well. The Lightkeeper story is where this issue takes off. It has a nice buildup to the horror and, like those old EC Comics stories, adds a little justified vengeance to the horror mix. If you like your horror stories to have a bit of moral comeuppance, you will love The Lightkeeper. The 7” vinyl soundtrack has three tracks. 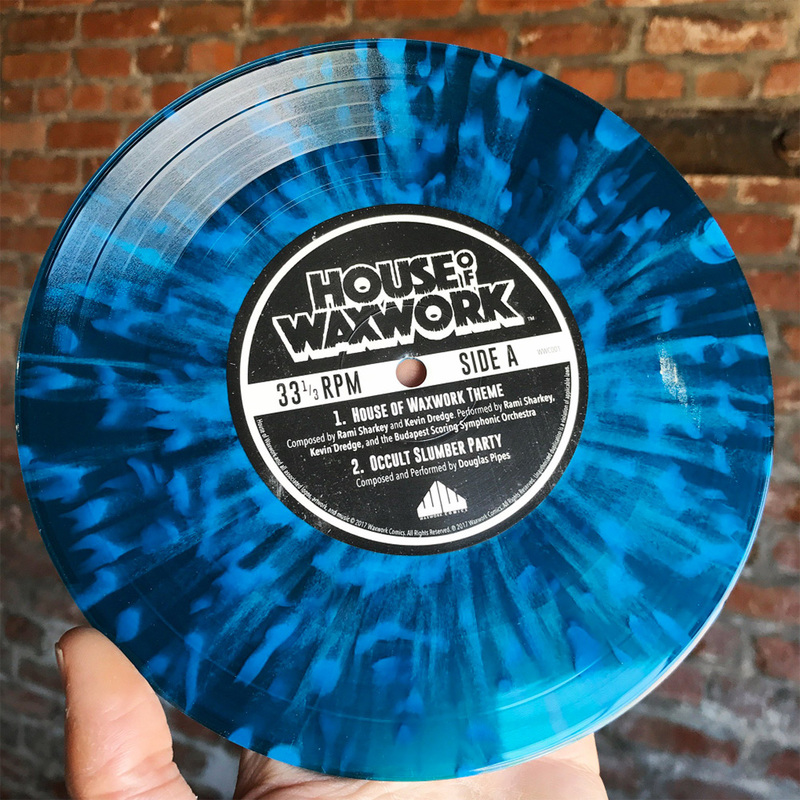 Side A has two tracks — House of Waxwork Theme composed by Rami Sharkey and Kevin Dredge. Performed by Rami Sharkey, Kevin Dredge and the Budapest Scoring Symphonic Orchestra. Occult Slumber Party composed and performed by Douglas Pipes. Side B has one track only – Lighthouse Keeper composed and performed by Creeper. 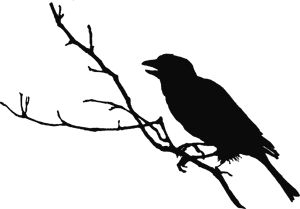 The theme song is a bit reminiscent of the HBO series’ Tales From The Crypt theme, and as a song for setting the mood, I found the tempo too fast to get in the haunting frame of mind. Occult Slumber Party is a nice track and well suited for the story it goes along with. The winner of the three songs is Lighthouse Keeper. With the Orchestra listed as performing the song, I was expecting something bombastic and full of strings, but was treated to something more akin to a John Carpenter score. That’s not a complaint, just a note of my surprise. The music by The Creeper is evocative and pairs well with the story. If I had one suggestion for the comic book, it would be to throw in some fake ads between stories. When I read comics, back in the day, there were always ads for sea monkeys, flying disc devices, or programs to turn you from geek to a muscle-bound super nerd. Those ads were fun to read through, and I believe some homage to those ads would be perfect for this comic. 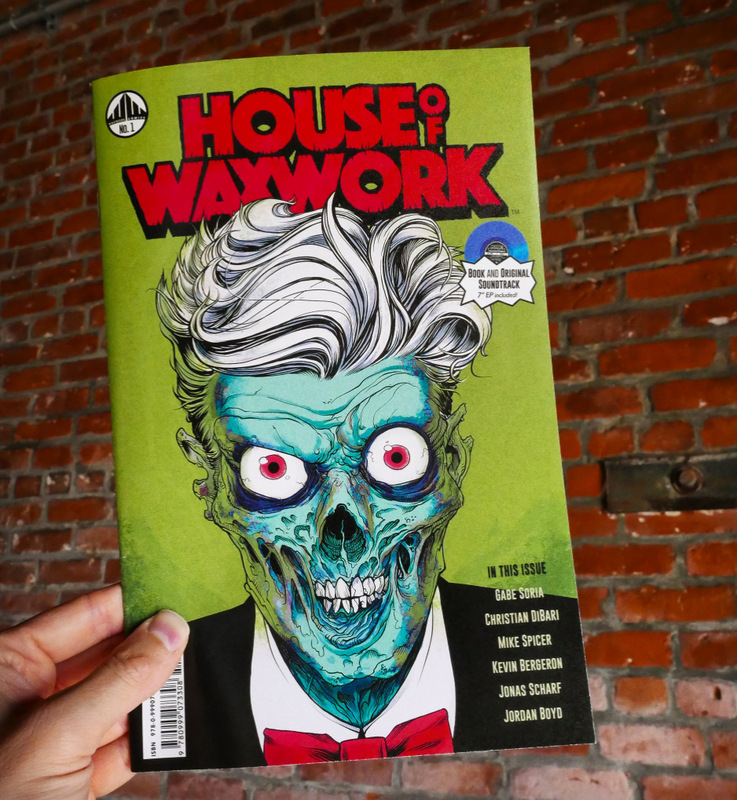 House of Waxwork Issue 1 is a great debut for Waxwork Comics. 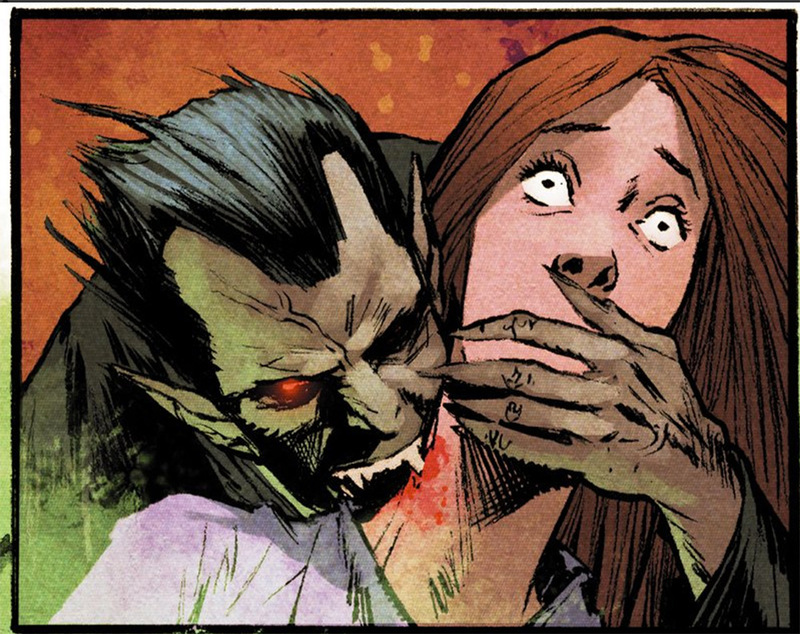 The issue has a combination of great artwork along with two spine-tingling stories of horror. Not only is this debut issue a nice homage to the past, but a tease of what their future horror comics might bring to the table. I eagerly await the next issue, which has been announced (but no release date yet).